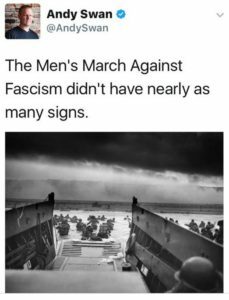 March Against Fascism, at theburningplatform.com. The Women’s March last week was against the “fascist” Trump presidency. Here is another way to look at it from Andy Swan. Here Are 2.3 Billion Reasons Why Sanctuary Cities Are So Upset At Trump, at zerohedge.com. The leaders of these sanctuary cities were motivated by the money they were getting from the Obama administration. Not because they cared about these people. Clinton Global Initiative Announces Layoffs Shutting Doors, at thepoliticalinsider.com. The “donations” they received from foreign countries are drying up. Maybe they were payments for future favors if Hilary had won. I’m so cynical. How The Obama Administration Quietly Bailed Out Private Equity Landlords At The Expense Of Middle Class Tax Payers, at zerohedge.com. Crony capitalism at the expense of the tax payers. The insiders in business get special favors from their crony pals in Government. This one is hidden inside the maze of Government regulation. Trump needs to swat this one away. San Francisco Bay Area Restaurants Are Disappearing After Minimum Wage Hike, at economicpolicyjournal.com. Good intentions can’t negate economic laws. Economic forces are always correcting government intervention. ABC News Apologizes After Ending Praise Of Sean Spicer To Sound Like Attack, at tammybruce.com. Fake News? Nothing new here. Trump Administration Puts A Freeze On Obama’s $221 Million Payment To Palestinians, at theblaze.com. Obama tried to sneak this order through, but Trump swatted it away. None of this money would have been used to fund terrorism, would it? The Anti-Trump Resistance: US Govt. Scientists Defy Trump With “Rogue” Twitter Accounts, at zerohedge.com. The battle is on between “apolitical public servants”, (partisan bureaucrats), and the Trump administration. It’s going to be fun to watch all this play out! Trump Administration Reportedly Fires Top State Department Officials, at theblaze.com. Repeat after me, “Drain the swamp”. Transcanada Responds To Trump Executive Order: Says Keystone XL Will Add $3 Billion To US GDP, at zerohedge.com. I would ask how environmental groups are going to react to this, but I think the better question is; How do you think Trump will react to how we know the environmental groups will react? President-Elect Trump’s Climate/Energy Policy: Hundred Day Action Plan A Good Start, by Robert Bradley Jr, at masterresource.com. Here is the first thing on the list, “We’re going to rescind all the job-destroying Obama executive actions including the Climate Action Plan and the Water of the U.S. rule.” That’s pretty good. How about the last thing on the list, “Any future regulation will go through a simple test: is this regulation good for the American worker? If it doesn’t pass this test, the rule will not be approved.” Click on the article to see some of his others. This Means War, at theburningplatform.com. This entry was posted on January 28, 2017 at 1:40 am and is filed under Must Reads For The Week. You can subscribe via RSS 2.0 feed to this post's comments.